Anna Myslak, 91, of Berlin, passed away peacefully at her home on Thursday, Aug. 9, 2018, with her family at her side. 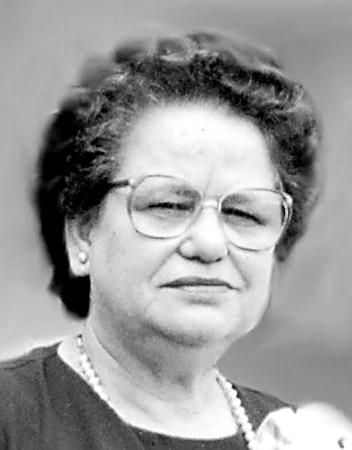 She was born in South Amboy, N.J., to the late Bronislaw and Antonina (Mroz) Bodziak. As a child, her family moved to Poland, where she lived until 1962. She then, along with her husband and children, returned to the U.S. and settled in Connecticut. She is survived by her daughters, Diane and Elizabeth Myslak of Berlin; her son, Stanley, and wife, Barbara of N.J., and her grandchildren, Krysten, Megan and Kevin. She also leaves her close friends, the Stepien Family. Anna was predeceased by her beloved husband, Stanley who passed in 2015, and her four siblings. The family would like to extend a special thank you to Anna's caregivers, Natalia and Marianna for the wonderful care they provided to their mom. Posted in New Britain Herald, on Friday, 10 August 2018 19:07. Updated: Friday, 10 August 2018 19:09.